Achieving mastery requires breaking through the shell of your own limitations—both actual and imagined—and struggling up to the freedom and enjoyment of real skill. 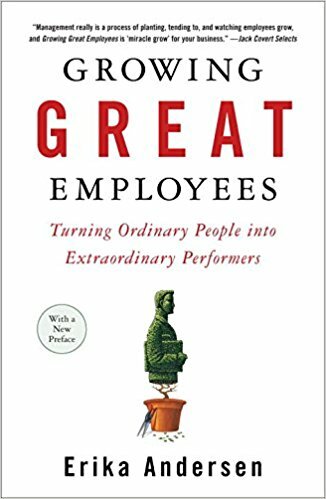 If you manage people at work or in any organization (even if you are a parent), this book offers a very helpful metaphor for discussing the difficulties in managing people. The title’s use of the word growing refers to the idea of a manager as a gardener. The idea is that you can’t make people “grow” or even do what you want them to do just because you want them to do it. The author covers the whole cycle of employment (although for families we don’t actually hire or fire). Omit any language that’s blameful or accusatory: you’re not trying to make the person see the error of his/her ways, or feel bad—you’re simply making it clear that they no longer have a job with the company, and telling them what will happen next. The metaphor is that a gardener has to do a lot of work to prepare the ground to receive the seeds. If you have ever painted a room, you know that most of the work is in preparing to paint. In the same way, a successful manager has to do a lot of things to set up success in his or her organization before the actual managing of people begins. Unfortunately the few employees who are consistently poor at keeping agreements often have the ability to convince you that it’s somehow your fault they’re not succeeding. The only real measure of the effectiveness of my teaching is what happens in the mind of the person learning. There is a lot more to the book in explaining these principles in more detail and the kinds of gardening techniques useful in succeeding with each of these principles. Anderson provides some helpful illustrations, charts, checklists, and anecdotes from both gardening and business management. It reads easily. And if you like the metaphor, it will make the book that much more helpful to you. I think the book can be quite helpful for the person (manager) who finds the metaphor intriguing. It appealed to me.